Artist Norman Saunders is best remembered as the man behind Topps’ Mars Attacks, a series of worst-case-scenario alien invasion trading cards that inspired an all-star, feature length film adaptation directed by Tim Burton in 1994. But Saunders’ tenure at Topps was not all Martians, ray guns, and UFOs. In the mid-1960s, with ABC’s Batman dominating popular culture, Saunders designed a campy, colorful series of cards featuring the Caped Crusader and his trusty sidekick, Robin, plus some memorable villains, including Joker and Riddler. Also, there are dinosaurs, medieval knights, and a pot of gold. That’s the kind of series this is. Sadly, despite the notoriety of the artist, these cards are somewhat obscure and are not easily found half a century later. Over at Comics Alliance, however, writer Chris Sims showcases a tantalizing collection of Saunders’ best and most insane Batman cards. It is Robin who inspires some of the loopiest images in this collection. In one hand-painted vignette, for example, Batman and Riddler do battle while climbing on a giant billboard featuring the Boy Wonder shilling for America’s dairy farmers. And it is Robin who literally slides down a rainbow that leads to the aforementioned pot of gold. According to Sims, the text on the back of the card reveals that, in this scenario, Riddler was expecting a leprechaun to appear instead. Because of course he was. Just what Robin plans to do when he reaches the end of this rainbow, apart from shatter his ankles, is unclear. The adventures of Riddler and Robin don’t end there, though. In another card, these two find themselves in some kind of intimate situation with Riddler attempting to brand Robin’s supple flesh with a question mark. It is interesting to note that Riddler is taking no chances here and has found protective gloves to match his green bodysuit. 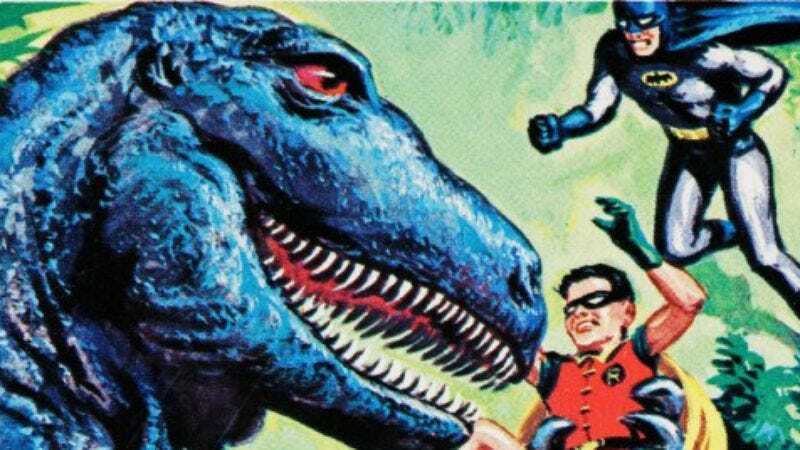 The trading card format allows Saunders to place both Batman and Robin in situations that never would have been possible on a live-action TV show in the 1960s, even with the budget of a major network. Here, for instance, they are seen kicking a rat the size of a Volkswagen. The possibilities, one senses, are truly endless.